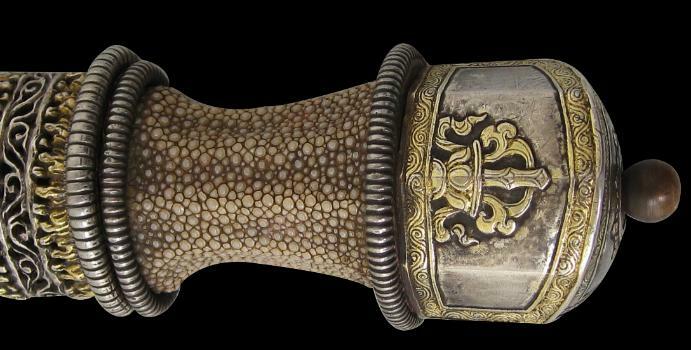 This splendid example of a traditional Bhutanese dagger has a sharp, single-edged steel blade. 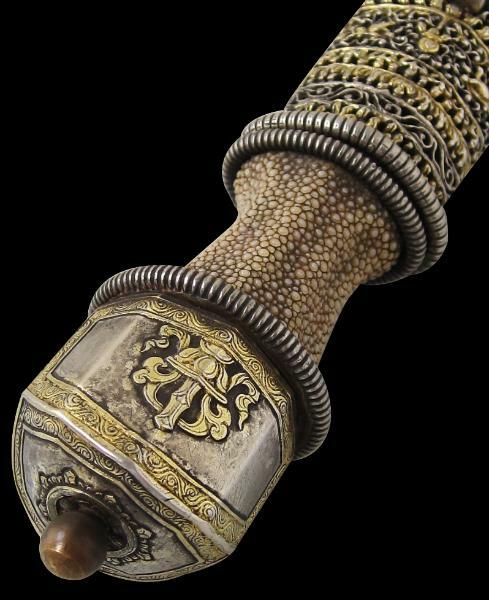 The handle comprises a gadrooned grip covered in fine shagreen and a cap-shaped pommel covered in parcel-gilt silver decorated with Bhutanese Buddhist symbols. 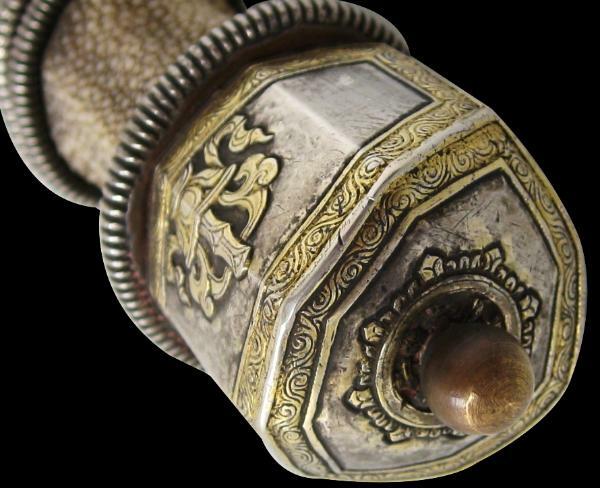 The top of the pommel is crested with a gilt spherical pommel nut that rises from a chakra wheel motif. 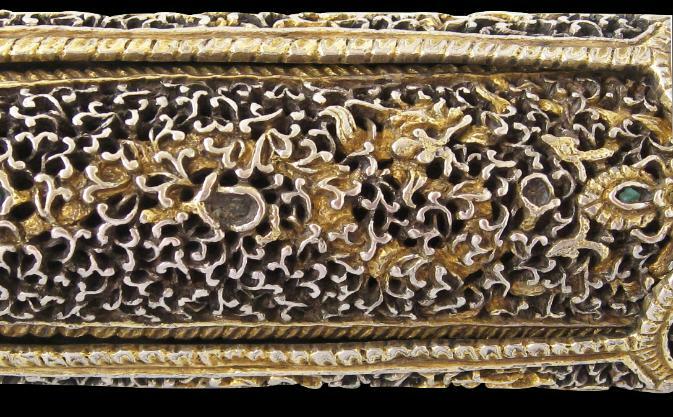 The magnificent scabbard comprises a fine, open-work parcel-gilt silver covering decorated with Himalayan dragons and Buddhistic symbols amid densely entwined foliate work. 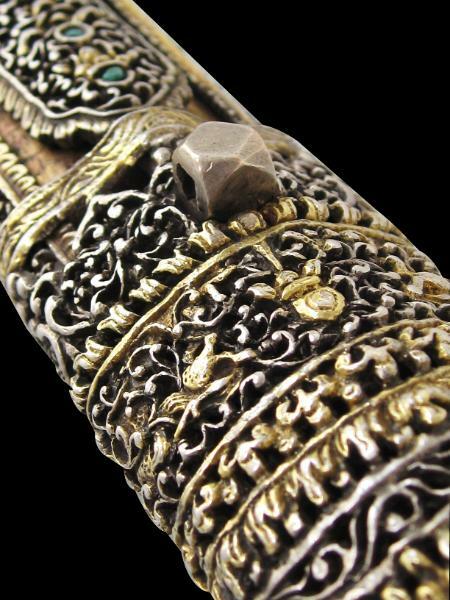 The scabbard is studded with small turquoise chips in box settings (some age-related losses). The principal dragon – its long, sinewy body runs the length of much of the front of the scabbard – is masterfully beneath the principal layer of high-relief foliate work, its body marked out in gilding. A gilded copper sheet sits beneath the open-work silver overlay on the front and reverse of the sheaf. The gilt-copper under-lay is more apparent on the reverse of the scabbard where it is engraved with scrolling fern motifs. 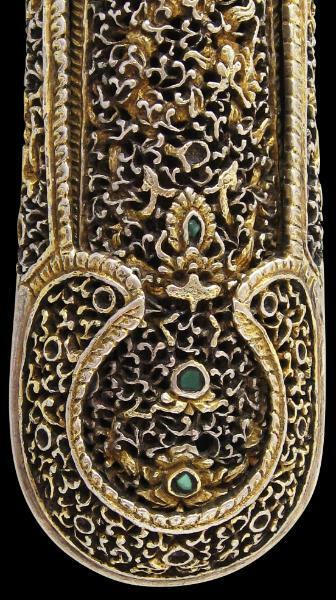 A dagger of this quality would almost certainly have been made for a member of the Bhutanese nobility. A similar Bhutanese dagger is in the Wallace Collection, London (inventory no. 1684). The catalogue detailing the Wallace Collection’s oriental arms and armour collection describes the Collection’s example as a ‘short dirk’ attributed to the mid-sixteenth century. This dating might seem ambitious, although it should be noted that the Wallace Collection was formed in the eighteenth and nineteenth centuries and clearly by which time the Collection’s Bhutanese dagger was clearly already very old judging from its patina and condition. Laking, G.F., Oriental Arms and Armour: Wallace Collection Catalogues, 1964.